✚ Thomas Fehlmann and Terrence Dixon‘s “Landline” is the one track off their recent We Take It From Here, out in April but only just this week appearing on Spotify, that dispenses with beats in favor of something entirely atmospheric. It’s also the final of the album’s six tracks, sort of reinforcing ambient techno’s role as after-party/VIP-lounge music. It’s on the Tresor label. ✚ “Raw Silk Uncut Wood” is the title track off the new Laurel Halo album (laurelhalo.com), released this past week on the Latency label (latency.fr). ✚ “Saying Goodbye” and “Where Are the Boys” are two tracks from Nick Cave and Warren Ellis‘ score for Kings, directed by Deniz Gamze Ergüven (Mustang) and starring Halle Berry and Daniel Craig. It was released recently on Milan Records. Ellis, a member of Cave’s band the Bad Seeds, did the score to the new Gauguin: Voyage to Tahiti docudrama, starring Vincent Cassel in the title role, but it’s not streaming yet (it is on YouTube). ✚ “Musles” is off How We Fall, the new J.Peter Schwalm album on RareNoiseRecords (rarenoiserecords.com). It features Eivind Aarset (Jon Hassell, Nils Petter Molvaer) on guitar and Tim Harries (Bill Bruford’s Earthworks, Steeleye Span) on bass. They were also on Schwalm’s previous album, The Beauty Of Disaster (2016). ✚ Adam Bryanbaum Wiltzie (A Winged Victory for the Sullen, Stars of the Lid) scored the new Whitney Houston documentary, Whitney, from director Kevin Macdonald (The Last King of Scotland, Touching the Void), but it’s not streaming yet. So, in the meanwhile, this is the end-credits cue from Wiltzie’s score to the 2015 film Salero. 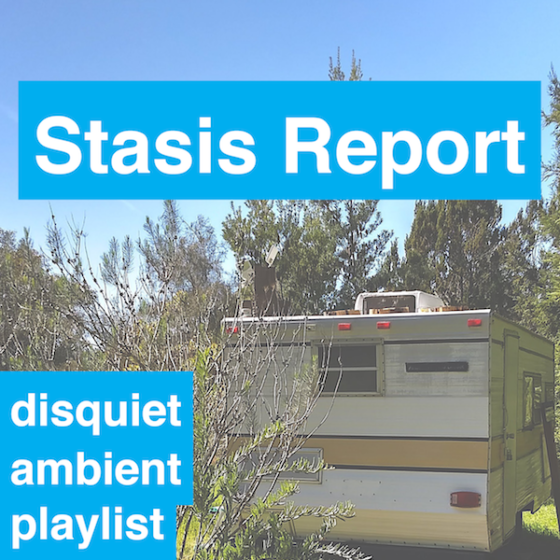 Some previous Stasis Report tracks were removed to make room for these, keeping the playlist length to roughly an hour and a half. Those tracks are now in the Stasis Archives playlist.